Donna Moore points out where one of the air conditioning units used to sit outside the food bank. Burglars who stole air-conditioning units and a refrigerator from the Divine Sent Food Cupboard in Oxford last week did more than $20,000 in damage. But they also kicked a hole in the spirits of volunteers who help feed 685 needy families throughout the year. Sometime in the early morning hours of June 8, a few determined burglars cut wires and removed two air-conditioning units that sat outside the metal building housing the food bank behind the Oxford Church of God on Barnsley Road. Then they pried open the metal siding on the back of the building, kicked through the drywall and stole a large stainless steel refrigerator. Before they left, they dumped 61 pounds of meat from one freezer onto the floor, leaving it to spoil before the burglary was discovered at about 9:30 a.m. on June 8. On the morning of June 15, Donna Moore, the interim pastor of the church and the director of the food cupboard, was able to get some perspective on the damage, but that doesn't mean she's not still angry. Police estimate the scrap value of the aluminum would fetch about $150 for the thieves. They have alerted area scrap yards about the nature of the materials, and fingerprints were found at the scene. But in a building where so many volunteers and clients come and go, it may be a long road to charging anyone for the thefts. Also stolen was the monitor and printer for the office computer, as well as a microwave and an industrial-size fan. As a result, volunteers are going to be sweltering inside the metal building that now lacks any ventilation. 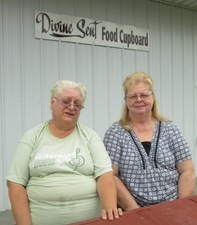 Donna Moore (right), the director of the Divine Sent Food Cupboard, and volunteer Connie Edwards. 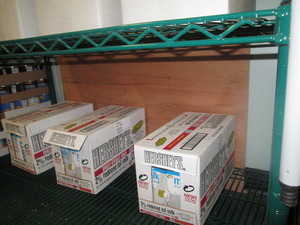 Without the missing refrigerator, deliveries of milk and eggs are being stored in the refrigerator in the basement of the nearby church, but it's not convenient for the volunteers or the families who come to the food cupboard for help. “We had just agreed to put in a security system that was coming in Thursday,” Moore said. “It would have had cameras.” There are security cameras on the homes to the left and right of the church, and a neighbor reported that their dogs were barking at something on the night of the burglary. There was a van seen outside of the food pantry, and a description has been given to the police. Moore isn't sure if insurance will cover any of the $20,000 loss to the pantry building since it is classified as an outbuilding. She'll find out this week. The building is only about a year old. The food pantry began in the church building in 2000, but soon outgrew the basement. The outbuilding has since been doubled in size, and still there is more need in the community, Moore said. “We were getting ready for a grand opening and dedication on July 11, but now that's on hold because we've got to do all the repairs. Last year, thieves stole a heat pump at the church building, costing $7,000 to replace. Now, this setback has Moore and the staff wondering where help will come from. She's asking the community for anything they can do – monetary support, volunteer repair work, or maybe even a donated refrigerator to get the food pantry back in business at peak levels. Checks made payable to the Divine Sent Food Cupboard can be mailed to the Oxford Church of God, 198 Barnsley Rd., Oxford, PA 19363. Moore's phone number is 443-553-5587 and she welcomes any assistance.